Subclavian artery aneurysm is extremely rare, and further aneurysm in a 3-year-old child is more exceptional. Most common causes of subclavian artery aneurysms are atherosclerosis, poststenotic thoracic outlet syndrome, infectious, trauma, and inflammatory arteritis, and connective tissue disorders. Pseudoaneurysms may be due to trauma or any iatrogenic injury to subclavian artery. We present a case report of a 3-year-old male child presented to us with recurrent cough without expectoration for 4-months duration due to compression by a large subclavian artery aneurysm. 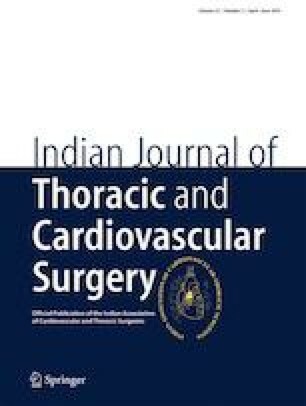 Patient was successfully managed surgically through left thoracotomy approach. After operation, the patient improved symptomatically. Child was asymptomatic at 3-month follow-up. This manuscript has been prepared in compliance with ethical standards.